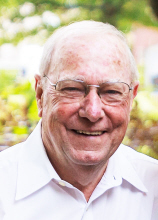 Charles Henry Hood, age 86, of Mattoon passed away at 10:35 a.m. on Tuesday, January 15, 2019 at Sarah Bush Lincoln Health Center. Funeral Services honoring his life will begin at 1:00 p.m. on Friday, January 18, 2019 at Schilling Funeral Home with Pastor Steve Hayes officiating. Burial with Military Rites will follow at Dodge Grove Cemetery. Visitation for family and friends will be held from 11:00 a.m. until time of service on Friday at Schilling Funeral Home. Charles was born on September 2, 1932 in Mattoon, IL the son of Homer and Wanda Madge (Hoban) Hood. He married Martha Walker on March 13, 1952. Survivors include his loving wife of 66 years, Martha Hood; children, Pam (Dann) Shores, Mark (Debra) Hood, Karen Poland and Kim (Chuck) Brown; grandchildren, Jason Shores, Jeremy Todd (Shieda) Hood, Neil (Kari) Shores, Selena Hood, Ashley Shores, Mallory Brown, Tyler (Stephanie) Poland and Brent Brown; six great grandchildren. Charles was preceded in death by his parents, two brothers and two sisters. Charles served honorably in the United States Army. Charles owned and operated Harold’s Cleaners for 26 years. He also worked as a shipping foreman and Secretary of the Credit Union for Young Radiator. He enjoyed swimming and treasured his time spent with his dog Haley. Charles was a dedicated family man, hard worker and would do anything to help anyone in need. Memorial donations in his honor may be given to his family. Online condolences may be expressed at www.schillingfuneralhome.net or Schilling Funeral Home’s Facebook page. To send flowers or a remembrance gift to the family of Charles Henry Hood, please visit our Tribute Store. "Email Address" would like to share the life celebration of Charles Henry Hood. Click on the "link" to go to share a favorite memory or leave a condolence message for the family.